Summer isn't over yet, which means there's still plenty of time to make a splash! Prime Time Toys make this possible with their fun water guns, pool toys, and water games. They also offer plenty of toys for exciting backyard amusement, as well. No matter if your child is diving for Dizzy Tubes, or shooting the Gatling Blaster, kids are sure to have plenty of outdoor fun! Prime Time Toys has been bringing customers enjoyable toys since 1990. They first began by introducing their famous Splash Balls and have since evolved into a very reputable company that offers many other innovative toys for fun both in and out of the water. Today, Their products are sold by thousands of retailers across the globe. Fun doesn't have to be expensive and Prime Time Toys proves that with their extremely low priced toys that range in price from $7.99 to $17.99. I recently was given an opportunity to select a fun water toy to review. Although, they all looked like a ton of fun I ended up selecting to review the Target Shot Hydro Blaster. During the summer my son has been spending a lot of time in the pool, so I knew this toy would add to his pool play enjoyment, and it sure did! The set comes with two pieces: a Hydro Blaster and a Target. 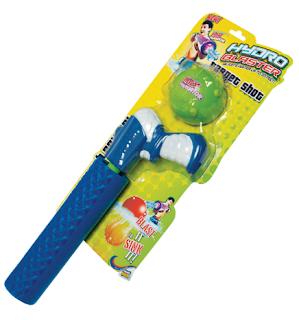 You simply use the Hydro Blaster to pump water from the pool and then shoot it at the target to sink it. This toy was perfect for my eight year old son since it is recommended for children 6+. He had a blast using the Hydro Blaster to shoot and sink the target. We were surprised that it blasted all the way up to 35 feet! It definitely added a unique fun twist to pool time fun. BUY IT: You can purchase the Target Shot Hydro Blaster for $17.99. LEARN MORE: To learn more be sure to visit Prime Time Toys online, connect with them on Facebook, and follow them on Twitter. WIN IT: Thanks to Prime Time Toys one of my lucky readers will receive their choice of any one toy from the following: Target Shot Hydro Blaster, Sunken Treasure, Marine Mine Target Shot, or a Big Jump Launcher!!! We love the Monster Blaster! My son would love to have the Hydro Blaster Max. So hard to choose but either the Hydro blaster or big jump launcher. I like the Hydro Blaster & Target. I'd choose the Hydro Blaster & Target.Thanks for the fun giveaway! I'd choose the Big Jump Launcher. Thanks. The monster blaster is cool.